I am trying to open some old Aldus Intellidraw files on my 64-bit Windows 10 PC. I have followed the instructions in this webpage (https://emaculation.com/doku.php/basilisk_ii_setup) and successfully set up Basilisk II. I completed every step in that guide, including updating it to System 7.5.5 and install "Aladdin Expander 5.5 Installer". 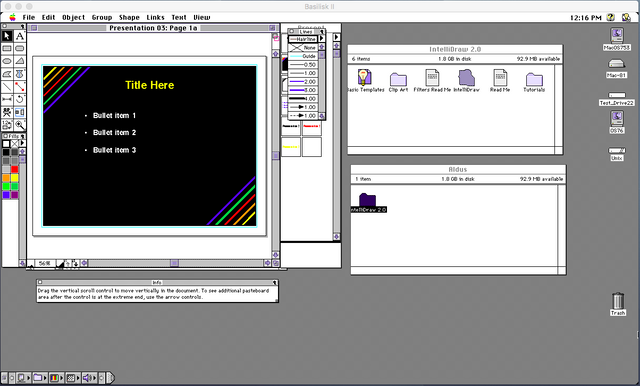 Then I downloaded the installation file for Aldus Intellidraw from the webpage (https://www.macintoshrepository.org/364 ... lidraw-2-0). When I expand the sit file in Basilisk using Aladdin, a folder containing an "img" file appeared. Then I got stuck since I don't know how to open this img file. I have searched on the internet and found this webpage (https://www.emaculation.com/forum/viewt ... f=6&t=7499), where it says that ".img files might be added to the volumes list in the basilisk GUI." I then tried to copy this img file to Windows (using HFVExplorer) and add it in the volume list in the basilisk II setting (the window that pops up after double-clicking BasiliskIIGUI.exe). However, the first screen after the booting of the mac system says "This disk is unreadable by this Macintosh," which again failed to open this img file. Any suggestions on how to proceed? Thanks! ("Unix" in OSX, "My Computer" or similar in Windows). 2.) Unstuff the .sit file on your Mac drive with Stuffit Expander. You should get an Aldus IntelliDraw DC6.3 folder with five disk images in it. 3.) Mount all five disk images by double clicking each of them. 4.) Run the Installer located on disk 1 (mounted in step 3). 5.) Run IntelliDraw for the first time and put in some names you like. You may point the installer to another place or another volume, if you wish. The installed app runs equally well with SheepShaver MacOS 7.6 BTW. If you run into trouble inflating and installing the app, I may add a pre-installed instance of IntelliDraw to the MacintoshGarden page. Original disk images from floppies are to be preferred for archiving purposes. Edit: Just added the pre installed copy to the server. Should work, when you add the unzipped img to the volumes tab in the emulators GUI. Does work on my side that way, but you will need to copy the Aldus folder to the System folder if you want to use "external" filters from there. When I double clicked the img file, it would not open. Instead, it said that the system doesn't know which application to use for this file. Use Print2PDF to print them all. I doubt you’ll be able to convert to Visio... even old Visio documents won’t do that. I was assuming an instance of DiskCopy6 was there with your installed MacOS. My bad, DiskCopy is not a obligatory installation, but it should be. Adobe Acrobat may be worth a try too for printing to pdf. Acrobat 3 was the last version for Motorola 68X00 Macs, later releases will need the PPC architecture offered by SheepShaver. BTW, I first looked for it here (https://www.emaculation.com/doku.php/68k_software). However, the link to print2pdf is broken (404 error, https://www.emaculation.com/basilisk/Pr ... -2.4.4.sit). Later I found it here (https://www.macintoshrepository.org/2292-printtopdf). I think this forum is where I should report this. Thanks. I installed DiskCopy, and now I can open the img files directly by double-clicking. BTW, I first looked for it here (https://www.emaculation.com/doku.php/68k_software). However, the link to print2pdf is broken (404 error, https://www.emaculation.com/basilisk/Pr ... -2.4.4.sit). Thanks. A long time ago the file was replaced with a newer version (2.4.5). The link was adjusted accordingly on the "All Downloads" page but apparently not on the 68k software page. I have done that now.